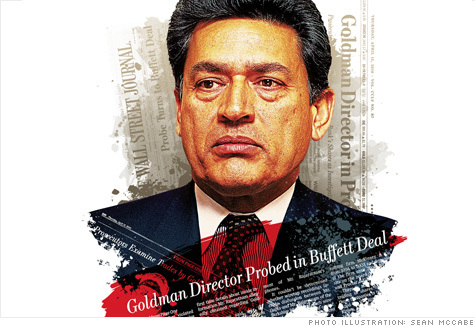 FORTUNE -- This is not the way the Rajat Gupta story is supposed to end. It's supposed to go out on a high note, like the previous chapters. He is an Indian nationalist's son who made it to Harvard Business School. He's the only non-Westerner to have served as managing director of storied management consulting firm McKinsey & Co., adviser to CEOs the world over. The ultimate behind-the-scenes business operator, Gupta over the years has whispered in the ear of everyone from Lloyd Blankfein of Goldman Sachs to Bill George of Medtronic to A.G. Lafley of Procter & Gamble. More recently he's become a global philanthropist who rubs shoulders with Bono, Bill Clinton, and Bill Gates, tackling problems like malaria in Africa and AIDS in India. And yet today, at 61 years of age -- a time when he should be taking victory laps -- his reputation hangs in the balance because of news reports that have linked him to the biggest insider-trading scandal in hedge fund history. In a front-page article on April 15, the Wall Street Journal reported that the government was investigating whether Gupta had shared confidential information with his onetime friend and business partner Raj Rajaratnam, the hedge fund heavyweight whose $3 billion Galleon fund disintegrated in October 2009 after authorities announced sweeping charges of illegal trading. The ongoing Galleon investigation includes an examination of trading in shares of Goldman Sachs (GS, Fortune 500). The government's filings don't name names, but in a second front-page story the Journal, citing an unnamed source, reported that Gupta -- a member of the Goldman board since late 2006 -- had tipped off Rajaratnam about Warren Buffett's confidence-boosting $5 billion investment in the teetering investment bank in September 2008, during the depths of the market turmoil. Gupta left the Goldman board in May when his term expired rather than stand for reelection. To date, no criminal charges have been filed against Gupta. Gupta's defenders say that any suggestion of impropriety is absurd for a man whose exemplary reputation has been built on the twin pillars of integrity and discretion. But Gupta's close association with Rajaratnam invites scrutiny. Government filings for a private equity firm that the two co-founded listed one of Gupta's homes as Rajaratnam's contact address as recently as 2008. They ran in the same social circles in New York, and, according to the Journal, Gupta was a frequent visitor at the Galleon offices. Other connections also raise suspicion. In January, Gupta's former protégé at McKinsey, Anil Kumar, pleaded guilty to providing Rajaratnam with confidential information. Kumar admitted taking a total of $2.6 million in exchange for revealing secrets about McKinsey clients, including chipmaker AMD (AMD, Fortune 500). It bears repeating: The government, which has hardly been reluctant to sling criminal charges in the Galleon case -- 21 people have been charged to date, and 12 have pleaded guilty to various charges -- has yet to accuse Gupta of anything. But he remains in limbo nonetheless, counseled to keep quiet by advisers while the legal process plods forward. Through a spokesperson, Gupta declined repeated requests to speak with Fortune for this article. But his lawyer offers a defiant statement of his client's innocence. "Rajat Gupta's record of ethical conduct and integrity in his professional as well as personal life is beyond reproach," says attorney Gary Naftalis. "He also has served with distinction and selflessness many philanthropic and civic causes around the world, including both the United States and India. Rajat has not violated any laws or regulations, nor has he done anything improper." Nevertheless, Gupta's limbo will probably persist at least until Rajaratnam goes to trial in January. (Rajaratnam has pleaded not guilty to all charges.) The outcome of a hearing scheduled for early October in which Rajaratnam's lawyers will challenge the admissibility of thousands of wiretapped conversations -- including, possibly, tapes of Gupta and Rajaratnam -- could have a significant bearing on the strength of the government's case. If evidence ultimately emerges that shows that Gupta provided Rajaratnam with confidential information, his exemplary reputation will be obliterated and his board positions at companies like P&G (PG, Fortune 500) will no doubt vanish. For now we are left with questions. Rajat Gupta spent his entire career at McKinsey, getting access to the privileged information of the companies McKinsey consulted. His post- McKinsey career has been built on utilizing the connections that he made during that time. Did he lose sight of the line between the two?